It’s election year once again and it promises to be another exciting and interesting race to the White House. 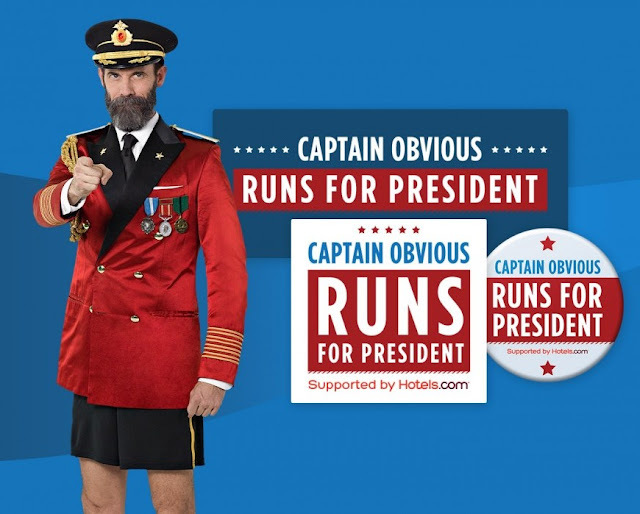 To make the race even more interesting, Captain Obvious runs for President supported by Hotels.com. Hotels.com is supporting Captain Obvious during his race because they believe in simplicity as much as he does - and he'll need a place to sleep at night. They’ll be providing him with running shoes, socks, shorts and everything else he needs for his run. Hotels.com sees the presidential race as a creative opportunity to utilize Captain Obvious as a way to be a part of, share in the broader cultural experience and to engage. Running the race the only way he knows how, Captain Obvious will also be sharing witty commentaries via his Twitter account as well as updates on his ‘run’ for the Presidency. If you don’t want to miss his running adventure and would like to know more about his journey, follow him @CaptainObvious and the hashtag #ObviousPresident. You can also find out what he thinks about your state or the other states if you follow him during the entire campaign period. Visit the Captain Obvious official website to learn how you can get involve, show your support or shop for Captain Obvious merchandise such as Captain Obvious shirts, campaign buttons, water bottle, duffel bag and cotton beach bottle. You can even download reaction GIFs that will come in handy whenever you have trouble expressing your emotions. With the support of Hotels.com, Captain Obvious will surely make this election year a truly fun and interesting experience for everyone. This is pretty funny! I think he is really funny! I think I may need to buy some gear! This is finally a candidate that deserves to "run." LOL :) I love this!! I am so sick of this presidential campaign!! It is just full of drama and nonsense! This is really funny. I have never heard of him before this post. I guess he is a qualified as some of the candidates this year. I reckon I'm going to have to follow Captain Obvious on Twitter to keep up. I love funny stuff. I had never heard of him before. He's hilarious! This is hilarious marketing. And with the state of our election I think captain obvious is a good choice. Haha honestly I think he is better than some of the candidates and that is saying something! HAHAHA! That made me giggle! I love it - he is so much fun! I needed the laugh that I got watching this fellow! Great marketing. I still think this is absolutely hilarious! That's a really funny concept and it's fun too. It's the break we all need from all of this fuzz about the elections! Hahahaha he's so really fun, and he makes me laugh when i see him. This commercial is really hilarious and fun! I'm so glad that this is for a good cause. I have always thought this guy was really funny. I always like when serious things like Presidential elections become a "lighthearted" and "funny" thing. That is awesome and hilarious! I would vote for him! I think I have heard of him before. This is funny and would be good to follow along to for a good laugh. I've seen these commercials floating around for a while. Theyre so funny! That's such a great commercial idea! Haha. I am already over the presidential campaign as well. A funny spin. The captain obvious commercials always give me a good laugh! Definitely great marketing!